Is Amazon EC2 HIPAA Eligible? Amazon EC2 is listed on the AWS HIPAA Eligible Services List. This means that organizations that sign Amazon’s Business Associates Agreement (BAA) and fulfill the AWS shared responsibility model may use EC2 with protected health information (PHI). In order to utilize EC2, you must implement administrative and technical requirements of shared responsibilities. Amazon Elastic Compute Cloud (Amazon EC2) is a web service that provides resizable computing resources. EC2 provides users with on-demand servers or virtual machines (VM). EC2 virtual machines can be configured with almost any operating system and application. Cloud users only pay for the EC2 computing power needed. EC2 can be configured in auto-scaling groups and EC2 services can be scaled up and down as computing requirements change. EC2 services can be configured across multiple availability zones (AZ) and regions to increase availability and service reliability. In order to utilize Amazon EC2 in a HIPAA compliant manner, organization’s account for all technical safeguards regarded EC2 access, data storage, transmission. This means that EC2 instances, their associated EBS volumes, and Security Groups should be configured to follow the principle of least privilege. Administrative policies must be in place to dictate who can access EC2 instances, how they are deployed, and how they are operated. For EC2 instances containing PHI, access via AWS console and as well as SSH (shell) should be limited to only necessary users. Previously, only dedicated EC2 instances HIPAA eligible. AWS has recently clarified, that organizations that sign the AWS BAA are no longer required to utilize Amazon EC2 dedicated instances or dedicated hosts to process protected health information (PHI). This means organizations may use any size EC2 instance with PHI. The removal of this requirement makes it easier for startups and small AWS customers to build and scale HIPAA compliant workloads using EC2. You can read Amazon Web Services’ announcement about the removal of the dedicated instance requirement here. HIPAA requires that organization implement “all necessary” security requirements for encrypting PHI at-rest and in-transit. For Amazon EC2, any EC2 instances that will contain PHI, must use encrypted EBS volumes for storing data. External access to EC2 should be over a SSL/TLS connection. HIPAA follows the principle of “Granting Least Privilege”, meaning that only necessary staff members should have access to PHI. Organizations should follow this principle when providing users with access to EC2. Only the minimal necessary staff should have access to production EC2 services. Organizations should use separate development environments and avoid storing PHI inside development environments. Teams should consider isolating EC2 environments using different AWS Virtual Private Clouds (VPCs) to separate EC2 instances. HIPAA requires that PHI must account for potential service outages and must be available in case of emergency. This means that organizations should have a disaster recovery policy and plan for incidents leading to EC2 unavailability. Security teams should create backups of EC2 instance data/EBS volumes containing PHI or production data. EC2 instances should be configured for high availability across multiple availability zones (AZs) to minimize the impact of a potential service outage. HIPAA requires that organizations collect and analyze audit logs related to PHI access. For EC2 instances containing PHI, organizations must collect access logs. Collecting these logs allows security teams the ability to detect suspicious activity and respond to potential security threats. Audit logging should be dictated alongside an Audit Logging Policy, with logs being reviewed periodically to analyze compliance issues. Audit logs should be reviewed quarterly to analyze suspicious activity. Security Groups that allow public access, or large port ranges of access may allow unauthorized users to access the instance and result in a breach. Production EC2 instances that do not have restricted staff access are vulnerable to insider threats and unauthorized modification of PHI. EBS Volumes that are unencrypted are vulnerable to 3rd parties and security breaches. EC2 Instances with operating systems (OS) that are not properly updated and patched, may be vulnerable to unauthorized user access. 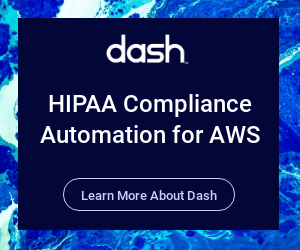 Dash simplifies HIPAA compliance in Amazon EC2. Dash enables healthcare organizations to define custom administrative policies and controls for EC2 including the System Access Policy, Configuration Management Policy, and Disaster Recovery Policy. Dash Continuous Compliance Monitoring scans EC2 security groups, EBS volumes and related AWS services including Amazon S3 and Amazon IAM for security and compliance issues, so security teams can monitor and maintain HIPAA compliance in EC2 and AWS. The Dash Compliance Automation Platform streamlines HIPAA management in AWS. Easily configure administrative and technical controls. Dash monitors all AWS cloud services for HIPAA compliance and security issues and provides instant alerts and steps for remediation. See how Dash can automates cloud compliance.